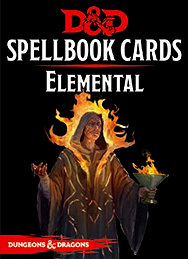 Contains 43 durable, laminated cards detailing elemental cantrips and spells. A perfect reference tool for spellcasters of every type. Find new spells, races, and player options in the free Elemental Evil Player's Companion available at DungeonsandDragons.com.